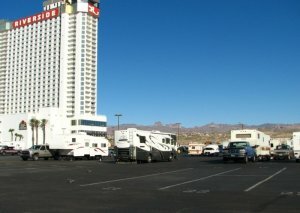 Large RV park. Stayed there several times for several days. During one stay split my head open on my slide-out. RV park called casino paramedics for me, who took me to urgent care. After 8 stitches I called the RV park back and they sent van to pick me up and take me back to my rig. I have not won a lot in their casino, but have had fun, for the most part, at Riverside. When they have their great car shows there is no overnite parking in the parking lot. While there take the boat ride on the Colorado River.